Welcome to my Vito camper-van conversion project. After a long time of looking and hankering I’ve finally made it to buying a van. The happy coincidence is that it’s already Offwidth-Images Orange, but that’s ex-RAC fleet vans for you. So now I have a whole new world of gear shopping and kit opportunities to keep me busy through the autumn and winter as I convert a standard panel van into a weekend camper-van. Over the coming months (more months than I ever imagined I am reliably informed) I’ll be posting my progress, successes, failures, and hopefully sharing my experience and hard earned Google links. If you’re curious or planning your own van conversion or camper conversion then check back here from time to time. I’d really like to hear of your own tips, tricks and suppliers. So I’ll start at the beginning with finding the van I wanted to convert. Having already narrowed the choice down to a Mercedes-Benz Vito we spent ages looking through eBay and the usual auto magazines for a standard panel van to convert. Budgetary constraints precluded buying a pre-converted van, and that really wasn’t the point anyway. The enjoyment comes from the doing – the more you put in the more you get out sort of thing. Everything seemed quite expensive for what you got. This is very true for the classic VWs and to a lesser extent for the Vito. The most common Vito you’ll find is the compact. (There’s also a long chassis on the same wheelbase and a long wheelbase version too). The compact is room enough for an easy weekend conversion, and given I don’t care about the kitchen sink and fixed cooker there’s sufficient space to work with. Pretty much everything we saw seemed to be over budget or typified the reputation for body rust that plagues older/unloved Vitos. As an alternative we looked at auction venues. It turns out there’s plenty of van choice available as large businesses sell on their old fleet vehicles. So it was we ended up at the British Car Auctions at Measham Commercials. They have a dedicated commercial auction that turns round hundreds of vehicles. When we went looking we caught a spate of ex-RAC fleet Vitos being sold on. Auctions were completely new to us, and to be honest it was pretty nerve-wracking stuff. It took one visit just to scope out how everything worked and get a feel for what people were paying. The number of regular dealers procuring vehicles was scary. It was initially difficult to figure out who was bidding as every gesture, every bid was so subtle; a raise of a finger, a lift of an eyebrow. On this first trip we saw a Vito sell for 3k and appear 48 hours later at a private yard with a 1k margin. The BCA website claims to welcome private buyers, and the staff are really very helpful and informative. The auctioneers can clearly spot the newbie, and play very fair. Be sure though that you know the costs involved if you’re buying your van here. On top of the hammer price you’ll additionally be paying a buyers fee (proportional to hammer price), VAT and a registration fee. 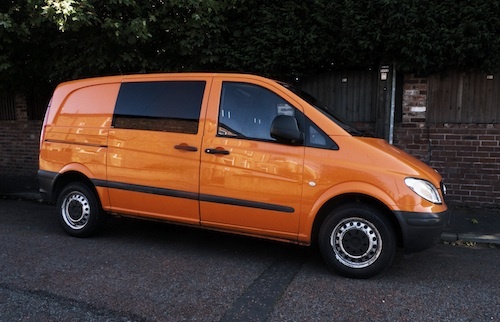 It’s fast and it’s hectic, and it really is easy to bid and to buy your van. Happy new year Mr. H, and welcome home. To be honest it was pretty much a financial constraint. VW’s were born for this and keep their value really well. Vito’s are cheaper (though you can certainly go much cheaper still), and maybe just as importantly I know a couple of folks that have them. They are small enough in height and width to be very much like any regular car, and have just enough curves to be pleasing on the eye. The Renault traffic for example is much squarer, giving you more interior space for sure.